The weather and course behaved itself for these championships. The organising committee, headed by David Deeble, were innovative and made many welcomed changes. 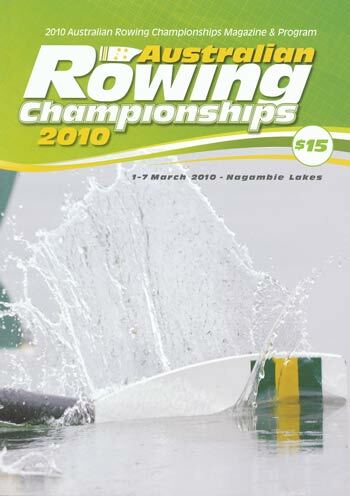 The publicity included an 8 page lift out in The Age newspaper and Rowing Australia arranged for the Interstate Championships to be televised on the internet. 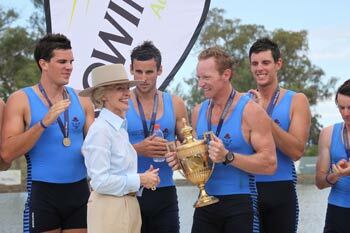 It was a well organised event for both rowers and spectators. 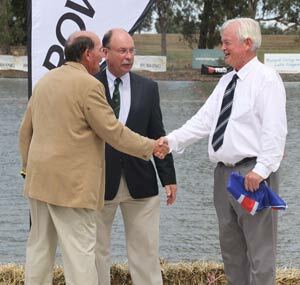 David Deeble (left) wishing Michael Eastaughffe (right) best wishes with the 2011 Championships in SA. RA President Colin Smith in the background. David Deeble (Chairman), Alice Evans (Event Manager), Eris Waller (Field of Play), Andrew Guerin (Program), Rene Klupacs (IT), Nick Gall (Sponsorship & marketing), Lance Deveson (Volunteers), Denis Bourke (Medical), Matt Draper (RA), David Pincus (Finance), Chris Grunmmit (Programming) & Catherine McMillan (Shire & Venue). The magnitude of this win was significant and the win evident early in the racing. The RV President Andrew Guerin was again presented with the trophy with Victoria having won it now four time more than any other State. Victor Walter NSW (President), Brian Kelleher WA, Geoff Northam NSW, Peter Monti NZL, Roger Milne NZL, Vanessa McIver NZL, Phil Gunning QLD, Tony Levic QLD, Bob Pennington SA, Brett Ralph SA, Greg Melbourne SA, Philip Fraser TAS, David Grubits VIC, Brett Woolfitt WA, Brian Nash WA, Craig James WA, John Murdoh WA, Lynne Bayliss WA.